SQL Server is one of the leading databases of market, thanks to the strenght of the name of its sponsor, Microsoft. For this reason, there are various applications, especially WEB, that use it. The database performance and quality are important differences that make it the first option of choice in many environments. Being developed by Microsoft, SQL Server is fully optimized for the Windows environment, and because of this, it is able to achieve higher levels of processing on servers that have Windows as operating system. The possibility of having Microsoft support, currently one of the largest leading companies in the segment. If dealing with the use of SQL Server with Scriptcase, the connection feature with the database aims to facilitate the maximum possible implementation by the developer. 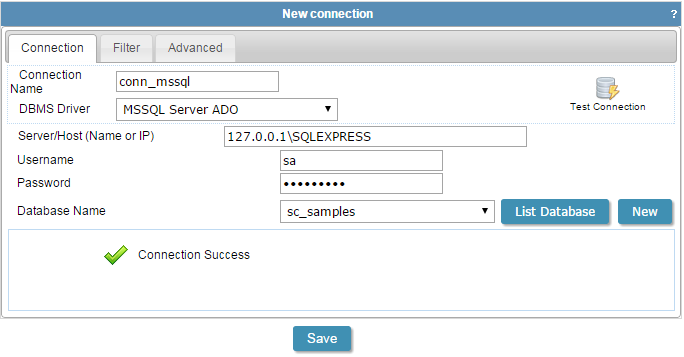 Adding a new connection to the project by entering the authentication information (username and password from the database) through a simple configurator, the connection is easily accomplished with the SQL Server database application and, therefore, you can quickly start developping registration screens, queries and reports. SQL Server is one of the most respected databases in the market. There are many applications using it, including web applications, due for its performance and quality. Developed by Microsoft, SQL Server ends up being fully optimized for Windows environments and it gets higher levels of processing on servers that have Windows installed. As PHP is multi-platform, it is not difficult to find projects that use it with SQL Server, by the way these two technologies combined aggregate high value to the project as they have some benefits like: The speed to process information on the application server and on the database server. The safety, quality and integrity of data that SQL Server can guarantee and etc. Server/Host(Name or IP): The physical address from the database, it may be local on your machine, on your local network or remote in the cloud. Scriptcase support stored procedures and all SQL statements (joins, order by, group by, among others) of SQL Server, why lose time when you have Scriptcase to help you out?! Download it now and test it free for 20 days!